Description: CW44AC 482 is rockin'-n'-rollin' off of the Old Main Line with unit coal train U837 in tow. Description: CSX K940 is passing by North End Double Track in Winter Park. Description: CSXT 482 takes the hole at Bangor for Amtrak to pass him. Description: Sb coal train holding on the main next to racks of rail. 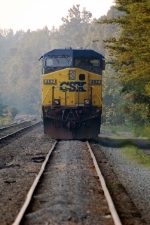 Description: CSX T102-22 crosses Wauhatchie Pike near the Yard. Description: Sorry about the angle, it was the only I could get of the big AC44 without tresspassing. Description: CSX 482 is the trailing unit on train Q116, as the train passes Q283 at CP64 in East Brookfield. Q283's lead unit, CSX 571, can be seen just behind that UPS trailer. Ron, Nick and Jon also photograph the train. Description: the power move to St. Louis for Q148 and Q638. Description: CSX 5112 and CSX 482 lead Q272 around the Toledo Wye and east to Detroit. Description: CSX AC44CW 482 leads Q57309 (Cincinnati Oh. to Nashville Tn.) towards Osborne Yard.